The media reports a lot about acts of terrorism, committed by Islamists, or ‘so-called’ Islamists recently. The tragic news come from many parts of the world — France, the USA, Turkey, the Middle East. The profane reader or observer might get the impression that all Muslims are abnormally aggressive. There is a risk that they could hand over these false submissions, received from one-sided media reports, to their fellow citizens. For some part of ordinary Ukrainians it could be difficult to distinguish ordinary Muslims from the radical Islamists. Sleeping mind produces monsters, and lack of information produces negative stereotypes. This is a very sensitive area for Ukraine, because, traditionally, Islam is a religion of the indigenous Crimean Tatar population. In addition, our country is a home for a significant number of Muslims, the various estimates range from 600 thousand to 2 million people. Over the past two years, much things have changed in the lives of Muslims in our country. The Crimea and the part of Donetsk region, where the important Muslim institutions were situated, came under Russian occupation. In fact, the Russia aggression has changed the structure of the Muslim organisations in Ukraine. This is exactly what Said Ismagilov, the Mufti of the Religious Administration of Muslims of Ukraine "Ummah" said in his speech. It is clear that, as the leader of one of the religious organisations, he cannot not be impartial, but he has an important insider information. So, in order to cover the state of the Islamic community in Ukraine, the authors will rely primarily on his analysis. And, of course, this article doesn’t claim to be an exhaustive review of the life of Muslims in Ukraine; however, it shows a number of trends that have emerged over the last quarter of the century, and especially after the Revolution of Dignity. Contemporary history: "The independence and the Muslim life of Ukraine are of the same age"
The independence of our country as well as the revival of the Muslim religious life within its borders have almost the same age, recalls mufti of RAMU "Ummah". After World War II there was no active mosque in the UkSSR. The activity of Muslim communities went underground by force and boiled down mainly to burial and funeral rites. Sometimes, Muslims had to masquerade even such rites as ordinary cemetery cleaning. Occasionally, they performed Nikah (wedding ceremony) and gave the children Muslim names. However, elderly residents of Donbass recalled that during Ramadan (according to the Muslim tradition each Muslim has to keep fast zealously) children were watered and fed by force in Soviet Schools. After 1991, the revival of Muslim religious life in Ukraine was going on due to two processes — Crimean Tatars had returned from the places of deportation, this process began in the second half of the 1980s, and the Muslim communities had come out the underground: the communities of Makiivka, Kyiv, Odesa and Kharkiv were among the first who had done that. A special role in the revival of Islamic life in Ukraine played Crimean Tatars, the majority of whom were deported to Muslim Uzbekistan. By the way, in the early 1990s, the first leader of the Crimean Muslims, Qadi Seit Dzhelil Ibragimov, wanted to unite all the Muslims of Ukraine. However, according to the mufti of RAMU "Ummah", this idea was torpedoed by Russia. Talgat Tadzhutdin, the mufti of the Central Spiritual Administration of Muslims of Russia, allegedly said that Kyiv should have another Mufti. And shortly before the Congress of Muslims in Simferopol the Religious Administration of Muslims of Ukraine was founded (hereinafter RAMU). Its leaders are apparently belong to anti-fundamental syncretic movement — Al-Ahbash that is in opposition to traditional Islam. Therefore, on continental Ukraine, not all followers of Islam joined the RAMU. As a result, the Spiritual Centre of Muslims of Ukraine was established in Donetsk in 1994, as well as the autonomous Muslim communities continued their own activities. According to Said Ismagilov, that was the end of the first phase of institutionalization of Ukrainian Muslims. The second phase is marked by establishing the religious administration of the independent Muslim communities of Ukraine "Kyiv Muftiyat" (hereinafter referred to as the 'Kyiv Muftiyat') and the Religious Administration of Muslims of Ukraine "Ummah" in 2007-2008. The first structure is mainly united the natives of the Volga-Ural region, and was financed by Tatarstan. Its leader was a member of the Russian Council of Muftis. The Religious Administration of Muslims of Ukraine "Ummah" (hereinafter RAMU "Ummah") was registered in 2008, which firstly united 10 different ethnic communities of Sunni Muslims. Arab, Azeri, Ukrainian, Tatar, Crimean Tatar communities are among them. Due to such diversity of memberships the right to choose the form of ministration was given to communities, as well as the right to re-elect the chairman and the mufti every two years. And the last right was performed in very democratic way – by general assembly. In 2009, Mufti Said Ismagilov was elected for the first time, and since then he has been regularly re-elected. The third phase of Muslim Ummah institutionalization in Ukraine was realized under the presidency of Yanukovych by registration of Ahbash Spiritual Center of Muslims of Crimea and the Religious Administration of Muslims of Ukraine “The Unity” (“Yedineniye”) the main centre of which was situated in Makiivka. Thus, 7 Religious centres were founded for several hundred thousand Islam followers in our country, four of which (RAMU, RAMU "Umma", SCMU and RAMU "Unity") had a nationwide status. Said Ismagilov notices that the Ukrainian mentality and the Ukrainian liberal legislation have created the good conditions for the development of quite liberal Muslim religious life. However, the number of registered religious communities shows that it went chaotically inside the Muslim Ummah. "Such a great number of muftiates for a million Muslims is too much", - said the mufti of RAMU "Ummah". And, furthermore, there are Shias, Salafis, representatives of other Islamic schools and brunches in Ukraine. Russian agression against Ukraine has caused radical negative changes to this situation. Present: "We have become a part of Ukrainian nation"
Among all denominations in Ukraine, the occupation of the Crimea and the Donbas region, perhaps, most painfully hit the Muslim one. According to Said Ismagilov, Ukraine is a home for about 1 million Muslims. The number 500-600 thousands is more precise, because, before the Russian aggression the Muslim population of the Crimea was approximately 300 thousand people. And it was the main part from the Ummah in Ukraine. Due to the actions of Russia, the contact with more than half of the Muslims has been lost. In particular, according to the Russian legislation, the largest association of Muslims in Ukraine, the Religious Administration of Muslims of Crimea (amounts about 400 communities) was forced to be re-registrated. The Spiritual Center of Muslims of Ukraine (approximately 20 communities), the Spiritual Center of Crimean Muslims (10 communities), and the Religious Administration of Ukrainian Muslims “The Unity” (“Yedineniye”) (9 communities) were fully on occupied territory. Thus, Said Ismagilov said that formally three religious associations of Muslims continue its activities, these are RAMU, RAMU "Ummah" and the Kyiv Muftiyat on the non-occupied territory of our country. However, the public activity of the latter hasn’t been observed for the last two years. According to Mufti RAMU "Ummah" that could be the result of the lack of Russian funding. So, in fact, today, the largest associations of Ukrainian Muslims are RAMU and RAMU "Ummah". The first one includes 150-160 registered communities, the second one – 30. But Said Ismagilov believes that this statistic does not reflect the true number of the faithful united in the administrations, and real authority and influence of the latter. He gave an example, when more than RAMU's 30 communities were registered at once in a village of the Kherson region. “With regard to the really existing communities, we have more of it”, - said the leader of the RAMU "Ummah". Do Muslims have the same paradoxical situation as the Ukrainian Orthodoxy, when the UOC-KP is considered to be the second largest Church with regard to officially registered communities but it has the largest papacy according to the sociological surveys? It should be mentioned that during those turbulent years of 2013-2016 the RAMU "Ummah" has been playing an active civil role, which objectively contributed to the consolidation of Ukrainian society, as well as the protection of the sovereignty and territorial integrity of Ukraine. It is the first and perhaps the only one among the Muslim organisations that condemned beating students in November 2013. Its representatives were at the Maidan. By the way, Tetiana Yevloieva, the muslim scholar, believes that due to the pilaf that the Crimean Tatars cooked at the Maidan, the Ukrainian society started to realize that Muslims also lived in our country. Of course, in the Crimea such understanding had come by at least a quarter-century earlier. The Muslim Congress, which was held in Snizhne in spring 2014, has demonstrated to the Ukrainian society the civic responsibility and courage of the RAMU "Ummah" faithful. Muslims of Donetsk and Lugansk regions condemned separatism and occupation of Ukrainian lands just after the beginning of the Russian military aggression against Ukraine. "The separatists still remember us this fact," - said Said Ismagilov. From the very beginning of the aggression the Muslims were in the ranks of the motherland defenders. The first Muslim was killed in ATO at the beginning of May 2014. "Muslims are dying for Ukraine, for protecting those who are not Muslims," - said Tetiana Yevloieva. According to her, already 6 Muslims were bestowed by the Order of Hero of Ukraine, some of them – posthumously. Imams chaplains also carry out their ministration at the front. The RAMU "Ummah" created the Directorate of the Military Chaplaincy of Muslims of Ukraine. According to Tetiana Yevloieva this Chaplaincy was registered in the Ministry of Defense of Ukraine after the meeting between Said Ismagilov, the mufti of RAMU "Ummah", and Muzhenko V. the Chief of General Staff. As Muslims are relatively few, and they are scattered around the military units, the ATO territory is divided into three sectors, and each sector has imam chaplain. They move between military units of the particular sector to help fellow believers in accordance with the needs. And if they are not able to help because of certain reasons,... Christian chaplains come to the aid. At the request of Muslim colleagues they bring soldiers halal food, prayer mats, Islamic books. The Muslim priests assist Christian soldiers in turn. Tetiana Yevloieva stresses that the cooperation between chaplains of different faiths is a unique phenomenon. She said about basic supplies, provided to internally displaced persons from the Crimea and Donbas region in mosques and Islamic Cultural Centres. In 2015, in the RAMU's mosques 7 tons of meat were distributed to immigrants of different faiths during the Eid al-Fitr holiday. For the several times, Muslim women have helped Kyiv Military Hospital by providing a food. The state authority has recognized the deportation of the Crimean Tatar People as genocide, set its official Day. Officials and society pay constant attention to the problems of the Crimean Tatars. Tetiana Yevloieva considers that those facts have a positive impact on the attitude to the Muslims in Ukraine. Several local museum have organized the exposition devoted to General Ichkeria Munayev Musa, who died in ATO defending Ukraine. The scholar believes that Ukrainians are reviewing pages of their own history associated with Islam. At the School of Islamic Studies Petro Kralyuk, the vice-rector of Ostroh Academy, noticed in his report that Ukrainians and Crimean Tatars had a peaceful and friendly relations for the much of their past. Tetiana Yevloieva recalled that Chechen families sheltered many Ukrainians during the Holodomor of 1932-1933. Said Ismagilov, the mufti of RAMU "Ummah", said that the Russian authorities had closed the Islamic Centre, the Hafiz School (reciters of Quran) and almost all the madrassas in the occupied territories of the Crimea. As a result, Meskhetian Turks are forced to move from the Donbas region to Turkey. This summer, that process should have been fully completed. A significant number of the Crimean Tatars has left the Crimea. As Said Ismagilov said, this situation with regard to Muslims can be discribed by the proverb: “Every dark cloud has a silver lining”. There were no Muslim communities west of Vinnytsia by 2014. Now it has appeared. Besides, the Islamic Cultural Centre has been opened in Lviv. One of such institutions currently is under construction in Chernivtsi. "We have become a part of the Ukrainian nation" - said Said Ismagilov. Here Mufti obviously has in mind the civil or political nation. And for most of Muslims, who are living in Ukraine, this statement is completely true. Future: "We will ukrainize Ummah in Ukraine"
So, what will happen to the Islamic Ummah in Ukraine? In our country, the majority of Ummah consists of indigenous representatives of the Crimean Tatars and of the populations from the Volga-Ural region, Central Asia, Azerbaijan and the North Caucasus, Turkey and the Arab countries. These people belong to quite different cultures, political trends and religious branches. So it is naturally, that sometimes the relations between them are a bit complicated. Said Ismagilov means the latent conflicts between Arab / Turks, Kurds / Turks, Crimean Tatars / Arabs, Salafis / Sufis, that overlap on the competition between religious groups in Ukraine, most of which are Sunni. Said Ismagilov considers that such ethnic variety and the chaotic process of formation of the Islamic institutions in our country require the improvement. In addition, he points out that the problem of other European countries, where Muslims are the minority, is self-isolation of Muslims, their unwillingness to integrate into the national life. RAMU "Ummah" has made a long-term program in order to develop the Muslim Ummah in Ukraine. It has strategic nature and significant consolidating capability. This program provides the consolidation of Muslims of different ethnic groups around Islam and their integration into the Ukrainian political nation. "We must teach our Muslims to love Ukraine and prevent the radicalization", - said Said Ismagilov. "We support the Ukrainian statehood, its independence, Ukrainian language." – stressed he. He says that they are ready to put those elements of Ukrainian culture, which do not contradict the Islam, into the practice of their community. By the way, he demonstrates it when he speaks Ukrainian language, and sometimes appears in public places, dressed in vyshyvanka. "We have tauhgt our imams to be patriots of Ukraine: they know the anthem of Ukraine, its legislation, they study Ukrainian language", – says the Mufti of RAMU "Ummah" with pride. He adds that they have the followers among other Islamic communities. It means, that the administration, headed by Said Ismagilov, managed to set the positive trend among co-religionists. "Our future is Ukrainian Muslims of different ethnic origin", – says he, referring to Belarusian Tatars as an example. And in the Crimea, the Crimean Tatar nation formed from the people of different ethnic elements. It was possible due to a consolidating influence of Islam. By the way, Mufti Said Ismagilov considers that, probably, the Ukrainian Islam will consist of two major branches: the Crimean Tatar and other Ukrainian Muslims with several minorities. He says that the Crimean Tatars " always stood apart," and they need Islam as the ideology to protect and to revive their nation. But at the same time the Mufti stresses the need for communication and cooperation with the Crimean Tatars, preventing conflicts with them. 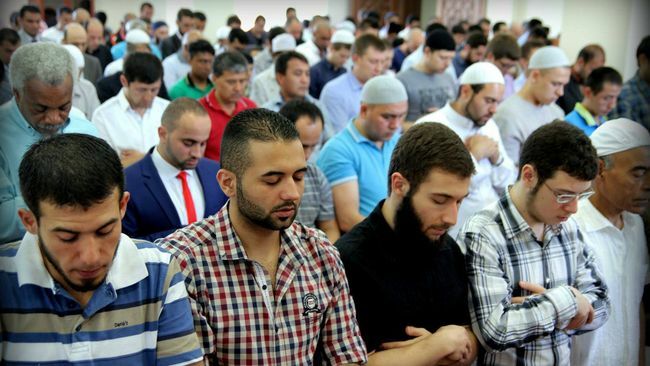 Now a lot of migrants from the Crimea attend mosques of RAMU "Ummah" because of religious affinity, as the services are performed in accordance with the Hanafi Sunni school. However, after the transition to the actual submission of the RAMU occupying power, the leaders of the Mejlis of the Crimean Tatar people insist on establishing the separate muftiyat for the Crimean Tatars on the continental Ukraine. However, due to a number of staff and other difficulties this idea will hardly be implemented. Said Ismagilov also mentioned “the scary story” about the danger, represented by the Islamisation in Ukraine, which sometimes appears in the Social Media space. “Meanwhile, Ukrainian Muslims assimilate. It is evident in the big cities – Kyiv, Kharkiv, Odesa. Grandmothers are Muslims, but the children don’t consider themselves as Muslims”, - says he. According to him, the number of ethnic Ukrainians, who adopt Islam, is very small, and, in general, they are women. For 6 years the mufti issued only 80 certificates of adoption of Islam in Kyiv. And it has taken place against a background of stadiums, filled up by the Jehovah's Witnesses or followers of pastor Volodymyr Muntyan. Said Ismagilov emphasizes that, the threat of Islamization does not concern us in Ukraine, we see the opposite process. According to his estimates, the number of Muslims in Ukraine will decrease for some time, then stabilize and begin to grow. Thus, the events of recent years show that the Ukrainian Muslims are actively involved in socio-political processes in Ukraine, in its defending by force of arms. Most of them have already become an important part of the Ukrainian political nation. Only our distant descendants will be able to answer whether another indigenous Muslim nation will appear in addition to Crimean Tatars in Ukraine. Maybe we are witnessing its birth ... However, it is a case of the long-run future. Meanwhile, we can say that there are influential forces in the Muslim environment of Ukraine that make a worthy contribution to the consolidation of our society and the protection of national interests.